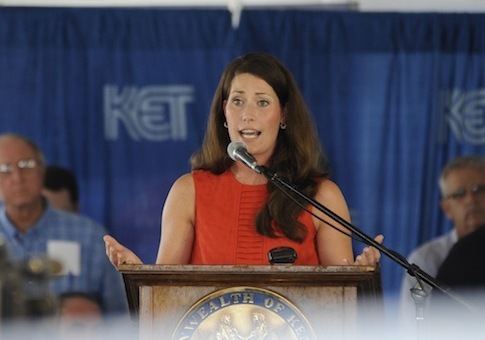 Kentucky Secretary of State Alison Lundergan Grimes is declining to call for Democratic State Rep. John A. Arnold to resign, leading her opponents to call her less than genuine about "fighting for Kentucky women." Arnold is currently facing formal complaints from three employees for sexual harassment. The allegations date back to 2009 and include Arnold grabbing the underwear of a staffer and touching the thigh of a female legislator. Grimes, who is currently in a Senate race against Minority Leader Mitch McConnell (R., Ky.), has issued two statements regarding the matter but has so far refused to call for Rep. Arnold to step down. However, while silent on the question of whether Arnold should resign, the Grimes campaign has accused McConnell of a "disgraceful pattern" against women after a Republican communications director called Grimes an "empty dress." "I strongly believe there is no place for harassment in the workplace whether you are female or male, and such behavior cannot be tolerated," Grimes said in a statement regarding Rep. Arnold to Courier-Journal Columnist Joseph Gerth on Aug. 25. "All Kentuckians deserve a safe work environment." "Due process must be afforded to protect all parties involved while also ensuring the public’s full confidence in the ongoing investigation," she said. Gerth wrote Grimes "whiffed" on the question. "Secretary of State Alison Lundergan Grimes, who mentions virtually every time she speaks that she is the state’s only female constitutional officer and who has been a champion of abused women, whiffed, giving a lawyerly answer rather than a heartfelt one when asked her thoughts on the subject," he wrote. Grimes was asked for a second time on Sunday if she wished Arnold to step down. "There is no place for harassment in the workplace, and such behavior is unacceptable," she said. "In the secretary of state’s office, we have a ‘no tolerance’ policy for this type of behavior, and it should be that same way throughout state government." "I am very disturbed by these allegations and support all efforts to hold Rep. Arnold accountable through public and open hearings," Grimes added. Republicans pounced on her remarks. "Even when given a second chance, Part-Time Grimes showed she’s only willing to fight part-time for Kentucky’s women, when it’s politically convenient for her," said Kelsey Cooper, communications director for the Kentucky GOP, in a statement Monday. "For someone running their campaign on ‘fighting for Kentucky women,’ her responses to the sexual harassment allegations are disturbingly weak and an absolute disappointment to women across the commonwealth," she said. In the midst of the sexual harassment scandal, Grimes mobilized her campaign to respond to a Republican operative calling her an "empty dress," accusing the McConnell campaign of waging a "war on women." "The latest assault from Mitch McConnell’s campaign team in the war on women is a sexist and offensive remark that reveals McConnell’s true feelings towards women," the Democratic Senatorial Campaign Committee (DSCC) said in a statement on Sept. 4. Brad Dayspring, communications director for the National Republican Senatorial Campaign Committee, told the Hill that Grimes is an "empty dress," and that she "seems incapable of articulating her own thoughts." The Grimes campaign claimed the comment was offensive. "This degrading and offensive comment from McConnell's campaign team is appalling, and he should condemn it immediately," Grimes spokeswoman Charly Norton told the Huffington Post. "It shows his team's true feelings towards women and continues his disgraceful pattern of not standing up for the women of Kentucky." Her campaign released a statement from her grandmother. "Evidently, Mitch’s team has been watching too many reruns and has not gotten the memo that it’s 2013 — not 1955," Elsie Case, Grimes’ grandmother, said. Female supporters of McConnell said the accusation was incorrect and obscured Grimes’ failure to criticize Democratic state legislators. "In the very building where Alison Lundergan Grimes works today there is an ongoing investigation into unspeakable sexual harassment allegations against a Democrat House member and potentially the Democrat leadership's efforts to cover it up," said Allison Ball, a state leader of the "Women for Team Mitch" coalition for the McConnell campaign. "Amazingly, instead of taking a strong stand and demanding answers for women in her own building, she has spent the day talking about a party spokesperson's comments in Washington, D.C.," she said. Requests for comment to the Grimes campaign and her secretary of state office were not returned. This entry was posted in Politics and tagged Alison Lundergan Grimes, Congress, Mitch McConnell. Bookmark the permalink.